The pieces of the California firestorm puzzle are slowly being put into their proper place. The photo above is a crucial piece of that puzzle. Notice the houses — ONLY — are destroyed; not burned to the ground, mind you, rather they are imploded which causes them to collapse in on themselves with great force and destruction. Also, notice how the trees and grass and streets and sidewalks show no evidence whatsoever of fire damage. That’s because there was no fire … and certainly not a wildfire anywhere near that residential subdivision. strategically carried out in the fertile valleys of California. Now we understand the extraordinary and relentless push to get SMART meters in every home and business in America. Even when the electrical grid goes down Smart meters are equipped with technology that provides a digital signature that can be identified by drones, airplanes and satellites from above. It also appears that these devices can be triggered to start a small isolated fire. 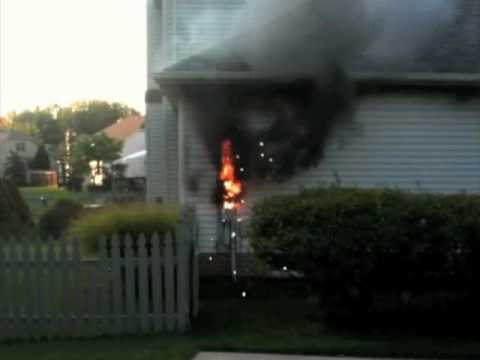 Whether they can be used to start a whole house electrical fire is also a distinct possibility. One thing is for sure: those homes were not burned to the ground. There is no evidence of fire damage, but a LOT of evidence of either an implosion or an explosion in some other cases. Investigators on the ground have reported all sorts of anomalies which include the vaporization of different parts of the buildings. Some parts of the structure are virtually disappeared whereas other things are left perfectly intact. This destructive phenomenon simply does not occur with a regular fire, particularly a wildfire. The photos at the link below tell a story about these California wildfires that is far different from the official narrative. In point of fact, they prove that directed energy weapons (DEWs) are being routinely utilized to destroy homes, businesses and other property all over the state. See how the windshield glass was totally melted. 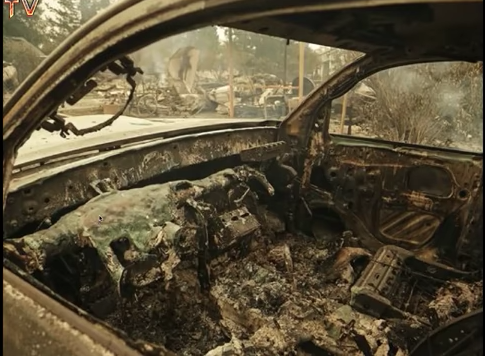 In several photos of demolished vehicles at the following link, it’s clear that an energy weapon was employed that not only melted the tire rims and hub caps, but also melted glass at a temperature of approximately 1400 °C to 1600 °C or 2552° to 2912° Fahrenheit. How did these vehicles burn up in the Cali. fires when trees nearby remain untouched? Which begs the question about what type of technology they are putting in vehicles these days. Is there also a “SMART meter” in every car, SUV and truck sold in America today? And if so, will it is also act as a transceiver for the DEWs stationed or flying overhead that can then train on them with precision? 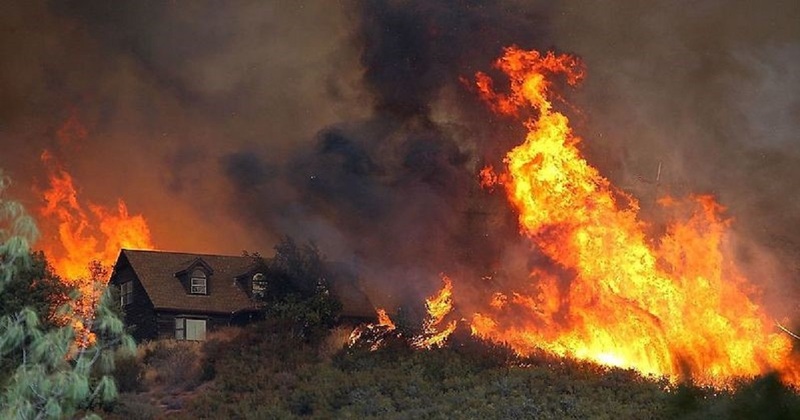 The current California wildfire season that began at the end of October has produced an unusual number of predicaments whereby the wildfires never even got close to the damaged areas. These transparent attacks, then, appear to be focused on certain neighborhoods and/or subdivisions. For the uninitiated, there are various communities that have been established all over America that are dedicated and/or intentional communities. Some of these are groups of ardent environmentalists who all live in the same neighborhood because of their shared values. Some of these communities are composed of only former CIA operatives who are still working undercover on a special project. Some of them are COINTELPRO agents assigned to a mission that requires them to all live close to each other. In any event, there are many communities that no one knows about, except those homeowners, which cohere around a specific endeavor or philosophy that might also be targeted by the government. If there is one state in the USA that has had this type of living arrangement going on for many decades, it’s California. The “Canyons” around Los Angeles are a perfect example of these secret intentional communities literally overseen by the C.I.A. Laurel Canyon, for example, had so many famous singers and actors living there many of whom met a violent or gruesome fate that it’s become quite notorious. The critical point here is that the homes that are destroyed appear to be targeted. Why some are completely spared and others totally demolished can only be explained by who’s pushing the button on the DEWs. 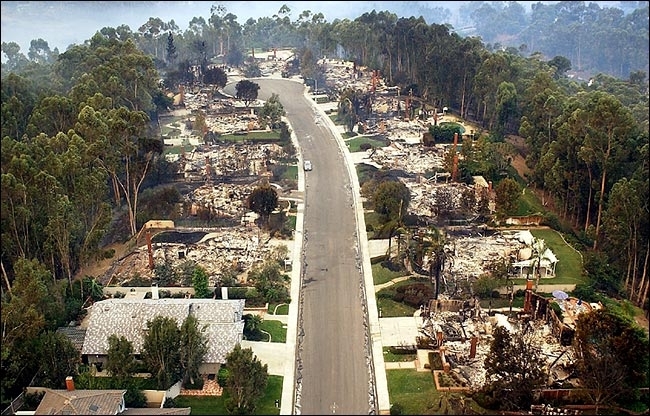 The rather concerning aspect of the California firestorm story is that this can happen anywhere in America. All that’s required is that the targeted region have homes with SMART meters, chemically geoengineered skies and an Air Force base or other military installation from which to launch a DEW. Even without the launch site, drones and low-altitude satellites can be used to trigger these events with great ease in the dark of night. Many deep researchers have warned about these SMART meters since the very day they were introduced to the public. EMF investigators have likewise sounded the alarms about various hidden frequencies of these devices that will have unintended consequences to anyone exposed to them. More significantly, because every home on the electrical grid will eventually have a SMART meter should they want to have power, every homeowner will be susceptible to these deadly and destructive attacks. The best way out of this mess for Californians is for them to educate their fellow residents about their true plight. Truly this story needs to go ultra-viral even if it’s by word of mouth. Only when there is a sufficient level of collective awareness throughout the state about this government-corporate conspiracy can the people stop these increasingly violent attacks on person and property. In so doing, they will initiate a popular movement that will then spread like wildfire to all the other Western states … and then across the whole country.